I like to spend some time in Mozambique The sunny sky is aqua blue and all the couples dancing cheek to cheek. It’s very nice to stay a week or two. […] Lying next to her by the ocean Reaching out and touching her hand, Whispering your secret emotion Magic in a magical land […] It was 1975 when Bob Dylan wrote “Mozambique”, third track of his album “Desire”. Located on southeast coast of Africa, bordered by the Indian Ocean, Mozambique is surrounded by more than 2,400 km of coastline, sheltered for most of their extension from the large island of Madagascar. 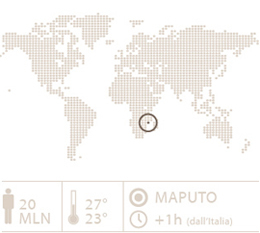 Mozambique covers an area of 801,590 km2. It is bound by the Makonde Plateau to the north, it is crossed along west by the Rift Valley and by fertile alluvial plains to the central and southern where Mozambique main rivers flow: the Zambezi, the Limpopo and the Save. Plant life is characterized by the savannah, by tropical forest near the rivers and by the Brachystegia forest in the highlands’ area. Long white sandy beaches, protected by an unhurt coral reef, stand in front of a sea of rare beauty, and face a vastness of small islands for 100 kilometers of coast. To reach Mozambique it is possible to directly fly to Maputo with Egypt Air through Cairo, with TAP through Lisbona, with Ethiopian Airlines through Addis Ababa, or to Johannesburg with South African Airways. The local currency is the Metical (MTN), which plural form is Meticais. 1 € equals about 81 Meticais. Banks and bancomat counters are almost in every town,“Millenium Banks are part of theCirrus circuit, the others of the Visa one. Credit cardsare generally accepted by major hotels and big structures only, while the mostly used card is Visa.It is suggested the traveller to additionally bring along enough cash in new circulation US Dollars, South African Rand or Euro. Saturdays market in Maputo cannot be lost, as it offers excellentMozambican and African craftsman souvenirs. At Inharrime market it is possible to find all main daily needed goods & staff, but also local craftsman products such as baskets and fabrics. For vehicles coming from South Africa the Insurance Policy for damages against Third Partiers is mandatory at 150 Rand plus 80 Rand for the carriage.